As I work towards completing the next of my quarterly Mayacast painting contests, I figured I ought to upload my previous entry! 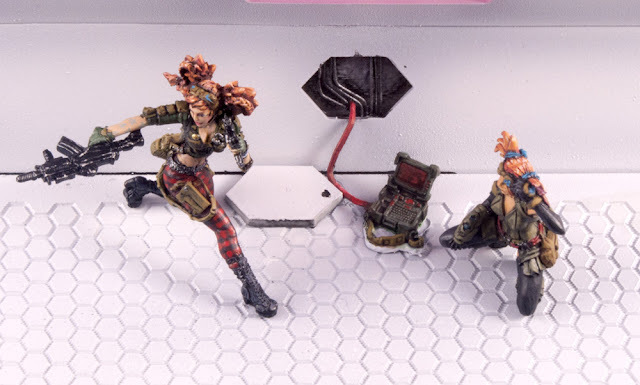 I tried to figure out a pairing that I had not previously done, and didn't want to group-paint with other folks (such as the Mobile Brigada hacker). I of course had just finished painting my Interventors at the time, and so they would not count for the project. 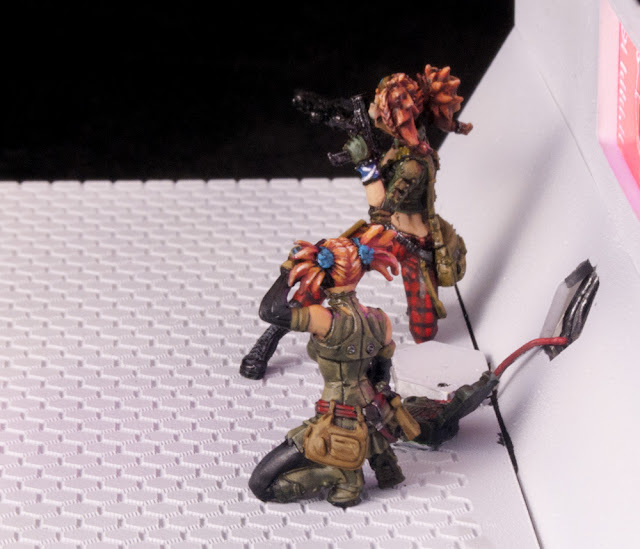 Shown here interrupted in their attempt to hack into an Aleph base, the two hackers are intended to be aiming at a target off-diorama. I went for a very basic, traditional look on their guns and gear, trying to make it look industrially hard-wearing. 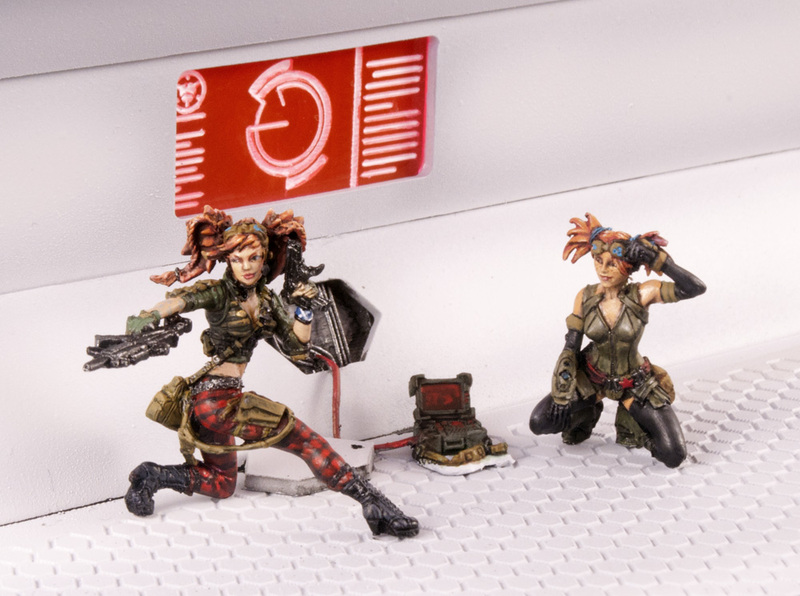 Since they're both hackers either mercenary or working for the most tech-limited faction, they wouldn't have fancy delicate comm gear that would smash the first time it was looked at funny. 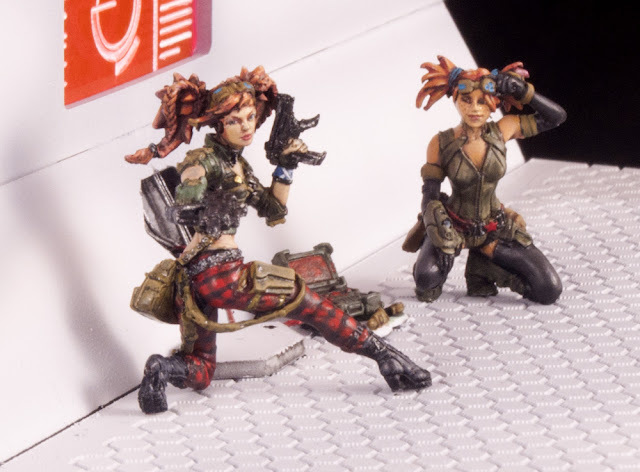 Other than that, it was spot colours here and there to accentuate the look of the pair, and a slightly different means of painting the fiery red hair on each, so they didn't entirely look like twins. 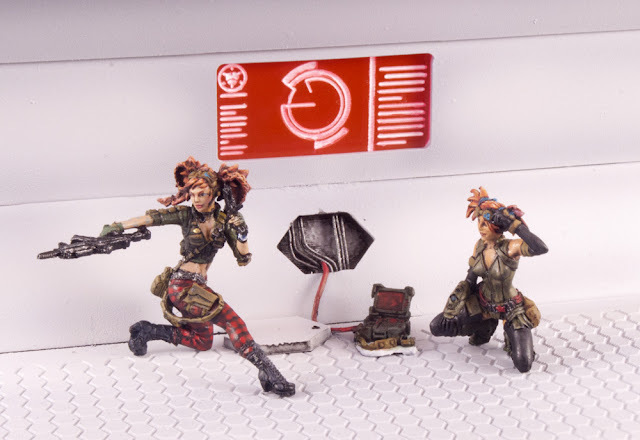 The base is made from laser-cut acrylic, glued together and lightly airbrushed, with the screen likewise made of fluorescent orange acrylic painted with white. You can also see I have painted Isobel MacGregor's pants using the stereotypical "Canadian Plaid" - I will be making my USAriadna models into CANAriadnans, and so this will help fit the theme. The hardest part about painting this pair was trying to make Isobel's face look right. The casting of the model has it incredibly flat - like someone squished her face with cling wrap. I had to reference the official paintscheme a few times to make sure I was sectioning off the face right, and ended up doing the equivalent of a makeup job to ensure the face felt right. Eventually they'll be plucked off this diorama and based individually for gaming, but for now it makes for an interesting display-case-piece!